When my father left the Navy and joined United Air Lines in the late 1950’s, he flew this plane, the DC-3. Like my Lunar Mobile Lounge, this has been at several BayLUG meetings, and now I am finally posting about it here. There are other parts that move as well: the ailerons, elevators, and rudder are all freely hinged. Oh, and the wheels rotate :-) The wings and vertical tail can be removed easily for storage and transportation. The fuselage is designed using half-stud offsets to achieve the desired shape. This means the walls are very fragile as they cannot be properly interconnected. On the leading edge of each wing are “de-icing boots” which are made of rubber in the real plane. 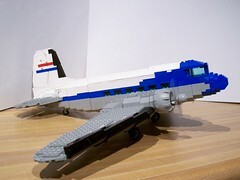 These are modeled using a curved brick that I got at LEGOLAND California in their “build it and buy it” area in 2003. I don’t know if they were ever part of an official LEGO set, but I never saw them anywhere else. It’s the same shape as the trans-light-blue spotlights in the Soccer sets. These “boots” are attached at an angle using plate hinges and plates, and have half-stud offsets to follow the desired wing angle. Overall this was an interesting experiment in half-stud offsets and integrating a Technic mechanism into a realistic looking model. I learned a lot making this and hope you enjoy it. Click the photo above to see more, or click to look on Flickr (slideshow) or on Brickshelf.